Marilyn and Rocky. – Dirty wet dog , boats and sailing. Please allow me to introduce my new best friends, Marilyn, and her mate Rocky. Marilyn is of course a Manson brand anchor a 7kg Manson supreme to be exact ,and Rocky is a 6kg Rocna : i think those 2 are just about the best anchors on the market for small boats although they are expensive as anchors go. These 2 anchors form the new set-up for my 23 foot Hunter Liberty and both of them are at the top of the suggested working range for my boat. Rocky , here just being taken off the weighted warp before its new set-up on the long kedge warp of 75m which i carry. This is my second anchor and usually lives in the stern locker. 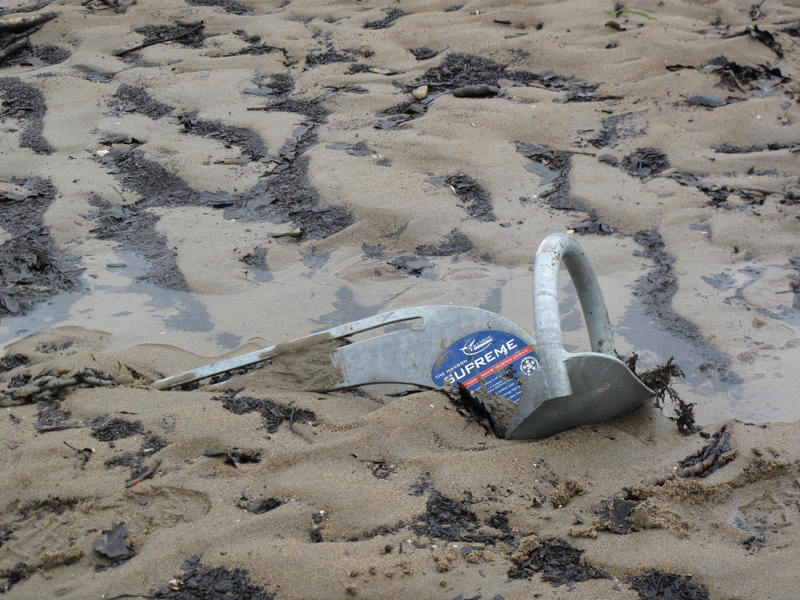 It’s usual use is that of a haul-off anchor which i deploy when running onto a beach to dry out. Up until now i have largely worked with the ‘D’ type anchor (Delta) and before that the Claw type (Bruce) but experiences on 3 boats with a Bruce type dragging put me off them and i stuck with the Delta type because they had always been reliable in my limited experience until this winter when i had one drag very slowly, admittedly in a soft silty bottom. 1.Bower anchor : normally set up in bow well is the 7kg Manson with 15 metres of 7mm chain and then shackled onto 30 metres of weighted 12mm warp. The 7mm chain is a bit unusual but i wanted something heavier than standard 6mm but didn’t want the weight of a similar length of 8mm chain. The 7mm chain comes in at 1kg per metre thus 15kg + the anchor on the bow but as far back in the well as i can get them. The warp is then deployed as needed from the cockpit so the anchoring gear now includes the fixed and closed bow fairlead, a lizard on the sidedeck which keeps the warp clear of the cabin and then the main anchoring cleat is aft on the side deck. My experience so with this system so far has been very positive : the Manson buries quickly, there seems to be enough weight in that length (2 x boat length) to achieve a strong catenary curve and as i routinely anchor in shallow water plenty of rode in total. I do now tend to pull the boat up to the warp/chain connecting shackle while standing in the cockpit and then just go forward to retrieve the chain and anchor straight into the pit. At some time the bow fairlead needs a rebuild with a roller out over the bow to reduce friction and chafe. 2.Kedge/second bower. Is now the 6kg Rocna and 75 metres of 14mm warp and is kept aft in the cockpit locker ready to deploy over the stern from a rope bag. The recovery system will include a new roller which will sit on a plate outboard of the cockpit coaming. The main use of that anchor so far has been when i walk it out into deep water when i have dried the boat out : i did in one instance plan to do a running drop as i sailed towards a beach again as a haul-off anchor and may use that system when i beach the boat in future. The additional purchase i may make will be another 30m length of weighted warp for when i set up a bahamian moor….i will blog that one soon as its a great set-up for rivers with a narrow channel and not much swinging room. This is the 75 metre warp being figure 8 stowed in its bag and is where i tend to deploy it from..it can of course be transferred quickly onto the bower if i needed it. Two very good anchors seems ok to me at this point, i did have 3 anchors on the longer and heavier Frances 26 although the 3rd anchor there was specifically a rock and kelp hook which i never did get to use. During my last trip i had to anchor several times in a lot more wind than i have so far and i must say that i am very happy with Marilyn : she bites fast, digs in hard on every surface that i have anchored on and stays put. Just once or twice she was a bit of a bear to break out but i see that as a good thing. Good anchors….my sort of insurance. Previous Very dirty, very wet. Next Honey i bought a caravan ! Neat set up may the holding always be good. I like the bow fairlead be interesting to see how it holds up. The bow fairlead is copied from lifeboats and pilot boats, while it certainly keeps the rode where it should be it really needs a roller as well. There is a bit of friction when lengthening or shortenning the rode from the cockpit and most times i find that i tend to deploy all the chain which i do from the bow by passing it over the fairlead and that because i tend to anchor in shallow water thats all it needs. It should be strong enough but needs a re-design with some cheeks and a roller ahead of the bow.